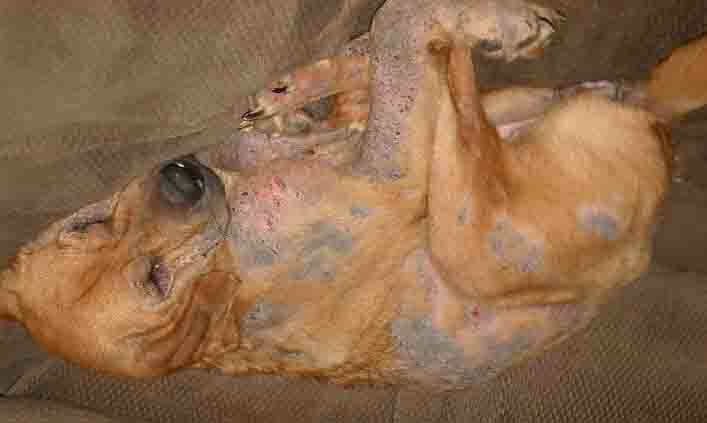 Demodectic mange in dogs (demodicosis) is caused by the Demodex canis mite. It is normal for a few mites to live on a dog. The number is held down by the dog's immune system. When the immune system is depressed due to some type of genetic disorder or illness, then the mite population is able to multiply, causing a problem for the dog. The mite lays eggs in dog hair follicles, where they grow from nymph (baby) through to adulthood. The entire cycle takes 18 to 24 days. This type of mange is usually seen in dogs that are between 3 and 12 moths, with the mites passed from mother to puppy (referred to as Juvenile on-set generalized Demodicosis). Symptoms are either localized, meaning they are in one or two areas of the body such as around the eyes and dog muzzle, or generalized, which means that it appears all over the body. In dogs under 1 year of age, demodex is referred to as Juvenile-onset demodicosis, where in adults it is called generalized adult-onset demodicosis. Symptoms vary depending of if problem is localized (in one area) or all over the dog (generalized). A veterinarian will take a skin scraping and look for mites under the microscope in addition to observing the clinical demodectic mange symptoms. As mentioned a veterinarian will first determine if the issue is localized or generalized and why the dog's immune system isn't providing natural protection against the mites. Unlike sarcoptic mange, the localized form demodectic mange can clear on its own in otherwise healthy dogs. A veterinarian may still recommend the use of a dip or medicated shampoo. For more chronic dog mange a lengthly treatment process is needed using products such as Mitaban (amitraz).. In dogs under 1 year, the condition can still clear on its own 50% of the time. In older dogs the condition can indicate a problem with the immune system, cancerous neoplasm (lymphosarcoma) or chronic disease (diabetes melitus or Cushing's disease). The most common way to treat demodectic mange in dogs is with a dip (Mitaban) which contains the miticide Amitraz. Prior to treatment the coat is clipped in long-haired or medium haired dogs. 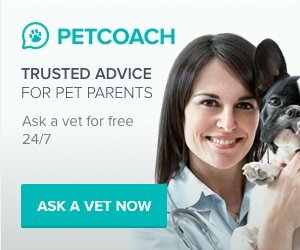 A dog starts by being treated every week, followed by bi-weekly treatments. If a dog does not respond to the dip, then Milbemycin oxime or Ivermetin can be provided for 2 to 3 months. Even if the condition cannot be cured, treatment could keep it under control. If Mitaban does not work, a veterinarian can use other medications that have not been approved for the treatment of demodectic mange in dogs such as Interceptor (milbemycin). If a dog has a bacterial skin infection, antibiotics are prescribed. Dogs should not breed if any pup is born with Juvenile On-set Generalized Demodicosis. Pregnancy can trigger a relapse in females, which is why neutering is recommended. During the healing process a natural remedy such as Skin Care & Coat may be of some value.